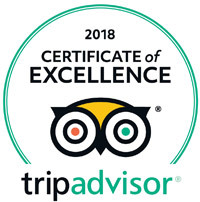 TripAdvisor annually awards the top rated businesses with the Certificate of Excellence Award. This award is based on the reviews that guests leave each business. It signifies that you consistently receive outstanding reviews from those who have visited your establishment. If you are interested in reviewing our park through TripAdvisor please click here. Lake George RV Park is one of only a few campgrounds, RV parks and resorts across the country to earn an all around “A” grade in the GuestRated™ satisfaction survey of RV parks and campgrounds since the program began. This grade is provided directly from our guests which makes it very special. This puts Lake George RV Park in the top 1% of campgrounds throughout the United States. We have received the highest rating, 10/10*/10, from the campground inspectors at Good Sam Travel Guide (Previously Woodall’s and TrailerLife). We are proud to be one of the only few campgrounds in the United States to have met the newest rating criteria. Recently Ann Emerson Vice President and Publisher at Good Sam RV Travel Guide provided the following statement. “Achieving our 10/10*/10 rating requires hard work, investment and attention to detail. We know that these ratings are not easy to attain and applaud Lake George’s efforts for achieving our highest rating. And we appreciate all that they do to provide exceptional quality and a first-rate experience to the camping public.” The purpose of these rating systems is comparable to that of a star or diamond rating scale for hotels and restaurants. It provides guidance for the consumer to help in their decision process to choose a RV Park that is a good fit for them. Northeast! To read the full article please click here.